With an ideal location, walkable distance from the popular Nai Harn beach, Villa Sapphire is an idyllic, four-bedroom, holiday home perfect from friends and family traveling to Phuket. The lively island offers a calm oasis replete with natural foliage, shrouded in traditional Chinese artwork and antiques complementary to Thai heritage. The combination of effervescent silks with the raw beauty of tropical vegetation creates a harmonious ambiance for guests to relish. With four bedrooms in the villa, there is room for eight people who can stay quite comfortably. The master suite is furnished with a four-poster, king-sized bed for a good-night’s rest. It has its own en-suite bathroom as well fitted with a soaking tub, ample wardrobe space and a walk-in shower. The second and third bedroom are furnished with a king-sized, and twin-beds with a common bathroom. The twin room is fitted with a flat-screen TV, books, board games etc. making it the perfect kids’ room. The last bedroom has an en-suite bathroom and bunk beds, also suitable for kids. The villa is part of a private complex, providing you absolute privacy from external disturbances, if at all. The infinity-style swimming pool resides snugly overlooking the expansive lush valley featuring tropical plants, trees, exotic flowers and so much more. Accompanying the lavish swimming pool is the sun deck which is home to many sun loungers for guests to rest on after a refreshing dip. Enjoy the natural breeze on your face as you work on your holiday tan. An outdoor dining area is housed under a traditional poolside sala, with an eight-seater dining table and BBQ equipment. There is a rattan sitting area as well so you can sleep out in the open under the clear blue skies. Accessible through sliding doors is the expansive living area at Villa Sapphire which has been designed to provide the utmost comfort in the coziest manner. With marble floors and whitewashed walls, the luxurious room is decorated with Chinese artefacts and antiques as well as some Thai artwork. The space is furnished with comfortable, plush couches which face the pool, so you can enjoy the view while you relax. A large, flat-screen TV, DVD player, cable TV with a selection of movie is also accessible for your entertainment. The false ceiling lighting shrouds the room in warm hues for a homely ambiance. You can dine on the indoor dining table as well, in case you want to eat in an air-conditioned area rather than outdoors. The fully-equipped kitchen resides in the corner and is fitted with modern facilities for guests to be able to cook whatever they wish for themselves and family. Friendly and accommodating staff welcome you to Villa Sapphire, extending their warm hospitality and ensuring that all your needs are met dutifully. 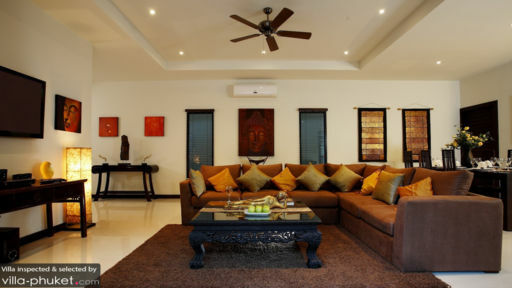 There is regular housekeeping and maintenance to keep the villa perfectly clean and functioning. The best part about Villa Sapphire is its closeness to Nai Harn beach, which is one of the most popular and the best beach in Phuket. It even has a lagoon that meets the ocean, where the beginners or children can try out their swimming skills. There are many amazing restaurants serving local food and Thai delicacies, as well as some shops and such nearby! We stayed at this villa for 8 nights in late June and really enjoyed our stay here. There are 4 good sized bedrooms which was perfect for our big family (7 of us including 3 young kids). Our kids loved the private pool and this villa is very child friendly as it has a pool security gate and pool toys for the kids to play with. The villa's housekeeper/cook was equally impressive and a great cook - her chicken satays and phad thai were delicious! She also helped arrange various activities for the kids like horseback riding and elephant trekking, The villa is about a 5 minute drive away from Nai Harn beach and the road with restaurants so quite convenient too. Highly recommend this villa to families who want to spend quality time in Phuket. We loved the Sapphire Villa for so many reasons. 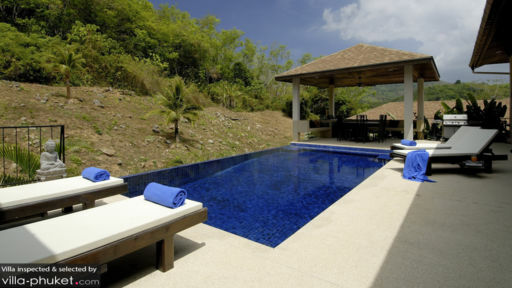 Firstly, Nai Harn is beautiful and the Villa is set into a hillside so it is private, with valley views and quiet. The maid is a brilliant cook. We hardly ate out after ordering a meal. The food she cooked was beautiful, authentic and healthy. The service is excellent at the Villas, including all the information before and during our stay. I would highly recommend this Villa. We had a wonderful time at Sapphire Villa. It's a lovely house that is well set up for a family, and it's close to the beach and amenities. The staff are very helpful, the pool and rooms are beautiful, and there are children's toys and movies for the little ones. Can't wait to return!